• Players break from huddle and sprint to LOS, set up in two point stance with 2 foot splits. • Weak side guard shifts a step backwards to become a back, while the first outside RB steps up to become a lineman. The center now becomes an eligible receiver. • WSG/RB goes in motion to the outside briskly to draw out CB. • Ball is snapped at a slight angle to QB who takes about 3 steps. • Linemen cut block anyone in front of them. • Outside RB's blocks down and set up for pass protection. • Inside RB blocks to the outside. 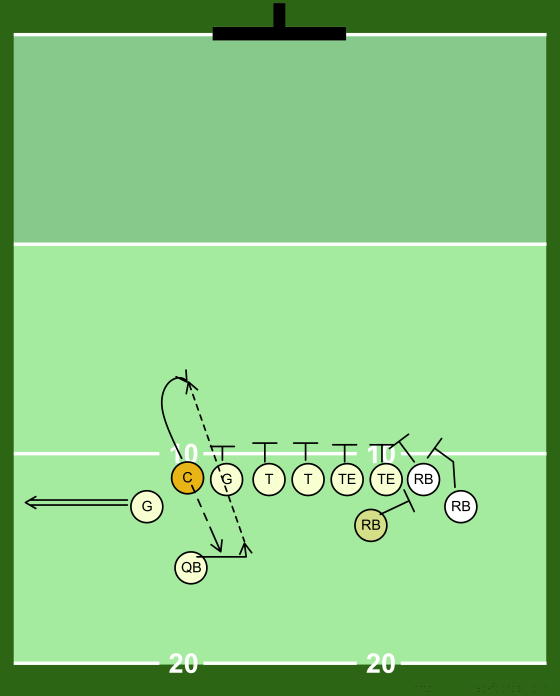 • After the QB catches the snap and has run about 3 steps he hits the center with a quick pass. • Defenses will cover the WSG/RB who is in motion, but totally forget about the center.